The Datavideo VP-634 is a 3G / HD / SD-SDI repeater with re-clock function (unpowered). The Datavideo VP-633/VP-634 SDI repeaters can each extend the range by a further 200m (high quality SDI cable). Up to 4 SDI Repeaters can be used in one chain, allowing runs of up to 1000m with good quality SDI cable. 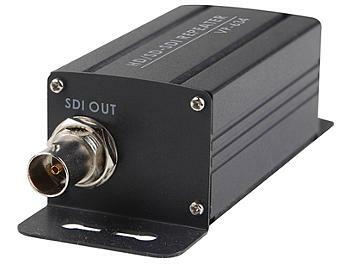 Each run must contain a VP-633 as this has a power connection to supply power through the SDI cables which then powers the subsequent VP-634's (which does not require additional power). For applications where runs of a few hundred meters are required (concert hall, sports stadium etc. ), the Datavideo VP-633 & VP-634 are a very cost effective solution.